It was at the height of the 1980s buyout boom when Mitt Romney went in search of $300 million to finance one of the most lucrative deals he would ever manage. The man who would help provide the money was none other than the famed junk-bond king Michael Milken. The Obama campaign has criticized the deal as showing Romney’s eagerness to make a “profit at any cost,” because workers lost jobs, and challenged Romney’s assertion that his business background best prepares him for the presidency. Romney, meanwhile, once referred to the deal as emanating from “the glorious days of Drexel Burnham,” saying, “it was fun while it lasted,” in a little-noticed interview with American Banker magazine. The “glorious” part, for Romney at least, was that he used junk-bond financing to turn a $10 million investment into a $175 million profit for himself, his partners, and his investors. It marked a turning point for Romney, according to Marc Wolpow, a former Drexel employee who was involved in the deal and later was hired by Romney to work at Bain Capital. So it was that Romney decided to rely on a man and a company in the thick of one of the most intensive investigations ever undertaken by the Securities and Exchange Commission. It happened in 1988, the fourth year of Bain Capital’s existence. Romney was shifting his focus from venture capital, funding younger companies, to buying larger, established businesses, which sometimes were troubled. Under this new strategy, known as a leveraged buyout, Romney could invest a relatively modest sum and borrow the rest to finance deals. The debt was then typically transferred to the companies Bain acquired. Bain earned management fees, dividends, and, if the company increased in value, massive profits. This deal was one of the mostly highly leveraged yet. It involved the purchase of two department store companies — Palais Royal, a small and profitable chain with 28 stores, and Bealls Brothers, a larger chain that was struggling — which Bain wanted to merge into a stronger and more successful brand. Given the high-risk nature of the deal and the amount of money needed to pull it off, Romney and his partners sought financing from Wall Street’s Drexel Burnham Lambert. It had a Boston office with about 20 employees, as well as a Beverly Hills office where Milken oversaw the junk-bond operation. Milken was so successful at selling risky bonds in exchange for possible double-digit returns that he had become one of the best-known and most controversial financiers in the nation by the time Romney and his partners met with him. A year earlier, Milken’s deals had earned him $550 million in salary and bonuses. Romney, the famously cautious investment manager, embraced the philosophy of Milken, the embodiment of the high-flying 1980s. Romney, according to his former partners, viewed Milken not just as someone who built up piles of cash, but also as an innovator whose deals could force bloated companies to become leaner, more efficient, and more profitable. Romney and Milken declined to comment, but former associates of both men said the seemingly Odd Couple pairing goes far in explaining why Romney became willing to do riskier deals for bigger payoffs. But there was a potential downside of doing business with Drexel. Just as the deal was about to be sealed in September 1988, the Securities and Exchange Commission filed a complaint against Milken and Drexel, alleging insider trading and stock manipulation. Some clients feared being tainted by scandal, but Romney stayed loyal: The deal was too important. But the deal nearly blew up anyway. The fraud case was being heard by US District Judge Milton Pollack. In what seemed a remarkable coincidence, the judge’s wife, Moselle Pollack, was chairwoman of Palais Royal, one of the department stores in Bain’s deal, and she stood to gain millions. But Rick Moseley, a former Drexel official who worked on the deal, said Drexel did not create the conflict and didn’t realize the judge’s wife had a stake in the deal. 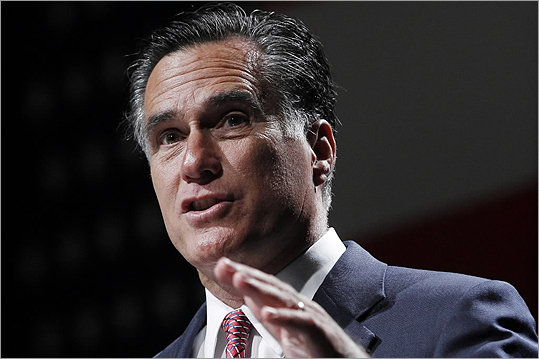 Romney and his partners were alarmed by the media furor over the alleged conflict of interest. Romney called Drexel’s chief executive, Fred Joseph, and was assured the controversy wouldn’t endanger the deal. Still, as reported in “The Real Romney,” a biography by two Globe reporters, some SEC officials were upset that Romney went ahead with Drexel, because it enabled the claim of a conflict to go forward. “By doing the deal, [Romney] enabled Drexel to use the claim of conflict of interest on the part of the judge, which I think at a minimum reflects a lack of concern about the impact of his financing activities on the administration of justice,” said James T. Coffman, a former SEC official who worked on the case. In the end, the matter became moot when Drexel pleaded guilty to six criminal counts of securities and mail fraud, paying $650 million in fines. Milken later pleaded guilty to securities and reporting violations and would serve 22 months in prison. By 1990, Drexel was bankrupt and out of business. In the meantime, Drexel’s financing for Bain succeeded. Romney distanced himself from the legal case, noting that his deal had nothing to do with the charges against Milken and Drexel. With the deal concluded, Bain Capital merged the department store chains into an entity that later became known as Stage Stores, which became responsible for paying off much of the debt. Business went well for several years as the chain grew and boosted profits, and was able to pay interest on the debt that Bain had placed on the company. “They did an incredible job of improving the business dramatically,” Moseley said. But the seeds of later problems for Stage Stores were sown while Bain was still on board, and eyeing the exit door. Bain’s hand-picked chief executive retired in 1993 and was replaced by Carl Tooker. Bain partners served on the board for four more years, helping take the company public in October 1996, at $16.50 a share, and approving an acquisition in June 1997 that added 246 stores, nearly doubling the chain. Bain had sold some of its shares in the low $30s and by September 1997 sold the rest at nearly $35 per share. Some at Bain wondered if they sold too soon. Indeed, the stock kept rising into 1998, and the firm actually bought back a minority stake. Shares peaked at $53 before diving as Stage Stores struggled with its expansion. Other shareholders filed a lawsuit in March 1999, alleging that the company and certain investors, including Bain, had inflated the company’s performance numbers and then dumped their stock. The suit was dismissed later that year. Bain Capital says it wasn’t responsible for the problems that led to the bankruptcy filing. That was often true for Romney. While he portrays himself as a turnaround specialist who helped create jobs in his time at Bain, his main role was that of financier — overseeing investment decisions and helping make connections as he did with Drexel. His was typically not the nitty-gritty work of running companies. But as the head of Bain Capital, Romney stood to profit when things went well or face blame when they did not. But Wolpow, the former Drexel employee who went to work for Bain, said the deal was a clear success for Bain Capital and its investors. Michael Kranish can be reached at kranish@globe.com. Follow him on Twitter @GlobeKranish. Beth Healy can be reached at bhealy@globe.com.